We recommend treating all ten toes due to the contagious nature of Onychomycosis. 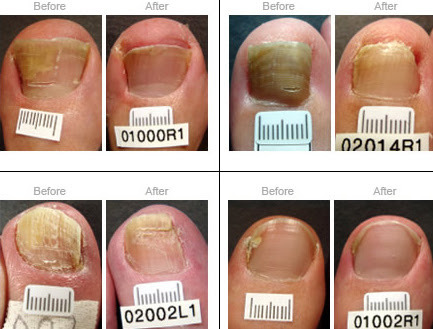 This toenail fungus treatment is most effective and affordable option over the long term. Signs and Symptoms of Toenail Fungus? The laser delivers light energy to gently heat the toenail bed and kill the toenail fungus and fungal spores. Depending on how many toes are affected, laser toenail fungus removal in Virginia will take 15-30 minutes. No. You may feel warm sensation. As your nail grows out, the new nail growth should be clear. Toe nails grow slowly –especially nails infected with fungus so it may take 6-12 months for your toenail to clear. How does laser toenail fungus compare to other toenail fungus treatments? Traditional treatments such as nail trimming, topical medicine, oral medicine or nail removal have significant drawbacks. Nail trimming doesn’t treat the fungus. Topical medicines need to be applied for 12 months and have a low success rate. Oral medicines are taken for 3 months but can cause liver or kidney problems. Laser therapy is a quick, easy, safe, effective procedure. Will my fungus be cured after one treatment? Generally no. Typically more than one treatment is required.